Shared ownership is a government backed initiative that helps people buy a home who can't afford to do so on the open market. Often referred to as part buy part rent, shared ownership is one of the most affordable home ownership options. Other options are available and these are outlined at www.HelptoBuy.org.uk. Shared ownership offers the chance to purchase a share of a property (25% - 75%), while paying a subsidised rent on the remainder. The monthly mortgage payment, rent and service charge can work out to be much cheaper than privately renting and shared ownership offers the long term security of owning a home. 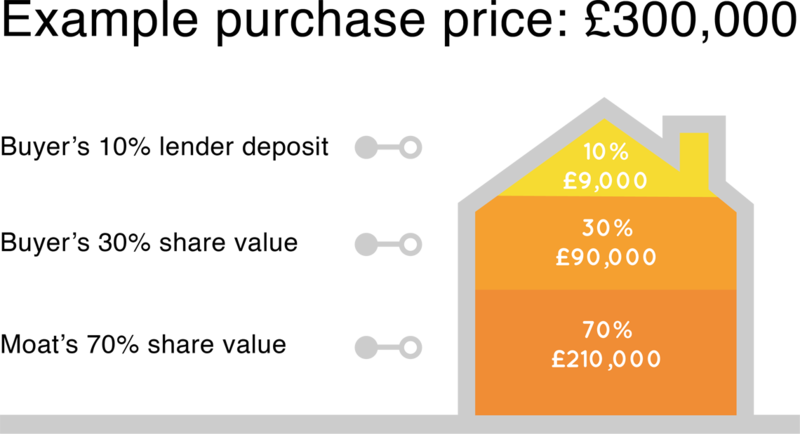 A 5% - 10% mortgage lender deposit is required for the share value being purchased which, in the current market, makes it possible to own a home through shared ownership. Shared ownership is a form of leasehold ownership (usually for 125 years) and the lease determines owners rights and responsibilities. Shared owners can sell their share to a new buyer whenever they want and further shares can be purchased at any time; this is known as "staircasing."